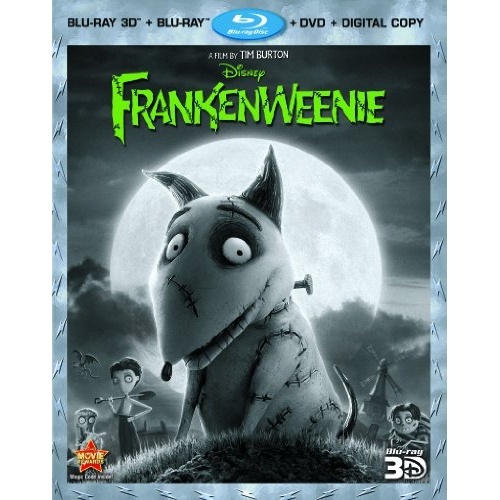 Unleash all the thrills as Frankenweenie sparks to life, leaping off the screen right into your living room in thrilling Blu-ray 3D - the absolute best you can get at home. From Disney and creative genius Tim Burton (Alice In Wonderland, The Nightmare Before Christmas) comes the hilarious and offbeat, Frankenweenie, a heartwarming tale about a boy and his dog. After unexpectedly losing his beloved dog Sparky, young Victor harnesses the power of science to bring his best friend back to life - with just a few minor adjustments. He tries to hide his home-sewn creation, but when Sparky gets out, Victor's fellow students, teachers and the entire town learn that getting a new "leash on life" can be monstrous. Complete with electrifying bonus features, Frankenweenie is alive with enchanting fun for the whole family in eye-popping Blu-ray 3D!